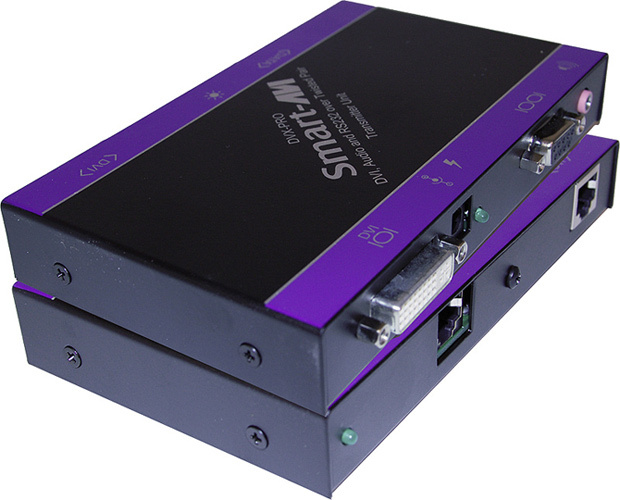 SmartAVI's DVX-PRO not only extends 1080p (1920x1080 resolution) HD DVI-D video signals up to 250 feet, but RS-232 functions as well. DVI-D and RS-232 Extension Solution Capable of 1080p Full HD video signal extension up to 250 feet, the DVX-Pro is a powerful solution for DVI-D extension. As an added bonus, the DVX-Pro also features RS-232 functionality, perfect for sending commands to devices remotely. These RS-232 control signals lets users switch channels or adjust audio from a convenient and comfortable distance. Affordable CAT5 Design The DVX-Pro uses highly affordable and popular CAT5 cabling to extend DVI-D signals without putting pressure on users' wallets. Great for use in restaurants, airports, retail stores, and more, the DVX-Pro pairs well with SmartAVI signage and video wall solutions in applications ranging from promotions to decorative digital displays. Kiosks: The maintenance of kiosks can be greatly reduced through the ability to support stations in single PC closet. Savings Savings: Saves on equipment costs, physical space and utilities expense. Productivity: Increases productivity by facilitating testing and performance evaluation of software and equipment, on multiple servers, from a single keyboard mouse and monitor station. Multimedia: Can be used in multimedia presentations, where the information is broadcasted to various KVM. Additionaly: Provides remote access of the PC with DVI-D, keyboard, mouse and sound.